The Generation Professionals Group is for utility professionals who work in biomass, coal, gas/oil, hydro, natural gas, or nuclear power generation fields. The mix of fuels used to generate electricity in the United States has changed in response to differences in the relative costs of electricity-generating technologies and their fuels. EIA’s Annual Energy Outlook 2019 (AEO2019) shows that projected generation and capacity is significantly influenced by natural gas prices. 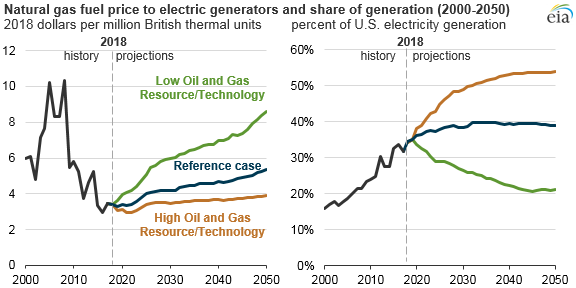 In the High Oil and Gas Resource and Technology scenario, a sensitivity case with low natural gas prices, natural gas provides 54% of all U.S. electricity generation by the end of the projection period. In the Low Oil and Gas Resource and Technology scenario, a corresponding sensitivity case with high natural gas prices, the natural gas generation share falls to 21%. Has there been a forecast about when coal fired generation would be phased out completely? "Clean energy advocates say the proposal will cost ratepayers more in the long run by defunding energy efficiency and clean energy measures...."
Can Nuclear Power Become More Economical and Help Address Climate Change by Modernizing Old Plants? Steve - in a word, no.